This year’s conference is packed with technical presentations on a production, characterization, applications and functionalizaton of renewable nanomaterials. Whether a researcher, product developer, student or entrepreneur, Nano 2015 has the knowledge and networks to launch your innovations. Dr. Theodora Retsina, CEO, American Process Inc.
“I think that nanocellulose will become one of those ubiquitous materials finding its way in all industrial sectors because of its biocompatibility and biodegradability. Product lifecycle and environmental footprint will play in favor of nanocellulose-based materials, be it in lightweight materials for automotive and aerospace applications or hydrophilic membranes in biodegradable products. I think that tissue repair and substitutes and the use of biocellulose are in our future." View the technical program for full details. Tabletop Exhibits: View the latest from technology and knowledge suppliers during conference breaks. View the conference brochure for full details. 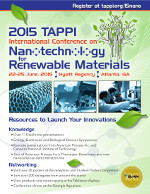 To honor TAPPI's 100th anniversary in 2015, the 2015 Conference will be held in Atlanta, Georgia, USA. TAPPI headquarters are located in Peachtree Corners, a northern suburb of Atlanta. Stop by the Registration Desk to collect your TAPPI 100 Year Pin. Download the 2015 Conference Brochure.